This is how you do a GREEN Cardistry deck! Cardistry KIWI Ninjas by De'vo. De'vo's playing cards are world famous for both their functional design and their superior handling abilities. They are used by the world's best card experts, poker players, and magicians! They have appeared on many television shows including Stan Lee's Superhumans television show, most recently on YouTube's Dude Perfect with over 43 MILLION VIEWS, and many other places! De'vo's cards are in the homes of celebrities and Hollywood superstars and are used by magicians, card players and card artists around the world. Some of his decks sell out just minutes after release! All of De'vo's cards are LIMITED EDITION, so do NOT miss your opportunity to purchase this amazing deck! De'vo co-created the art form of doing pure card manipulation separate from magic, and has created the world's first manipulation decks for this art. De'vo is the world's foremost authority on functional playing card design and manipulation. 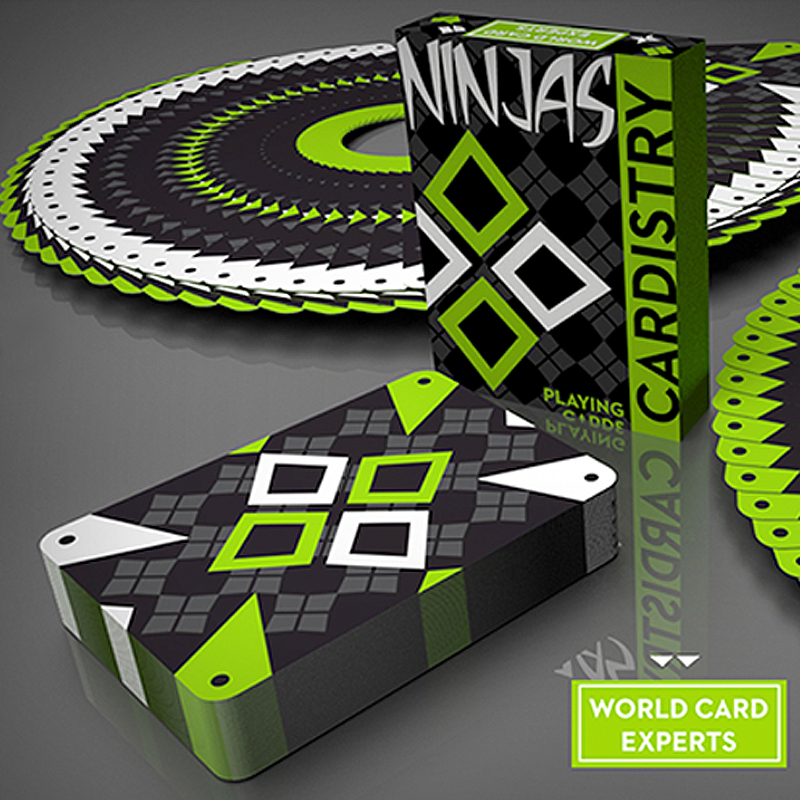 Cardistry Ninjas takes functional design to the NEXT LEVEL by offering many different looks depending on how this deck is manipulated. This deck has De'vo's "Twin Tip" signature design, meaning that you can shuffle them normally without mixing up the cards for both the faces AND the backs. This deck is PERFECT for magicians, card manipulators, poker players, collectors and especially those who want something bold and different! This is IT! Three special cards are included -- a WTF Cardistry/Bicycle Cardistry BW double backer for magic, a blank back and blank face card. Don't miss your chance to get one of the coolest Cardistry decks EVER! Get a few Cardistry Kiwi Ninjas before they are gone forever!